Climate change is already threatening the ability to survive on some islands where droughts and over use has caused saltwater intrusion into their freshwater lenses. In some locations this has made the water unsafe to drink while in others it has salt contaminated fields making family farms unsustainable. Air to water is a way to obtain water water from air with no risk of contamination. Our renewable powered air to water systems are ideal for locations where power is either not available or abnormally expensive such as when fuel for generators must be imported. It can scale from 6 gallons per day through millions of gallons per day. It can be commercially competitive with coastal desalt plants once power and membrane costs are factored in. Air Solar Water (Atmospheric Water Generator) technology which uses science to extract the humidity in air and convert it into liquid water. A2WH is a new generation of atmospheric water generator (AWG) which are also known as water maker devices (WM) and Water Air Extraction Devices (WAED). The Air Solar Water revolutionary design provides special characteristics that make it ideal for large scale deployment in situations where traditional designs would be prohibitively expensive. Civilian models operate off of Solar and Solar Thermal energy Once they are installed they will provide water for years with no additional energy or fuel costs. Air Solar Water provides high quality drinking water when there is no other water source available. When compared to common plug in or trailer mounted air to water systems the A2WH system can operate with much less energy. This allows it to save anywhere from 600 to 4,000 watts per gallon produced. This difference is critical because it allows A2WH to be deployed at scales that are infeasible for most other units. It also allows A2WH to provide a higher ROI. Air Solar Water's Grow Dryland can allow development of land where all the water rights have been already used up and no potable water is available. When source water such as wells, swamps, or oceans are available Air Solar Water can produce even more water with less energy. Smaller versions of Air Solar Water can provide basic water for individuals and villages in poverty stricken areas. Water is either unavailable or abnormally expensive. When RO filters are easily clogged such as when high levels of calcium are present. When disposing of waste brines from Desalination would be difficult or expensive. When power costs are abnormally high such as off grid or diesel generators. Where there is a strong sun resource or strong wind resources. Where wells are abnormally deep. Where wells are beginning to fail due to dropping aquifer or salt water intrusion. Where wells have become contaminated due to storms, flood, war or earthquakes. We launched Air Solar Water that describes our flagship technology for Solar Atmospheric Water Generators. Air Solar Water now has the A2WH-83S solar Water maker is available to buy now. 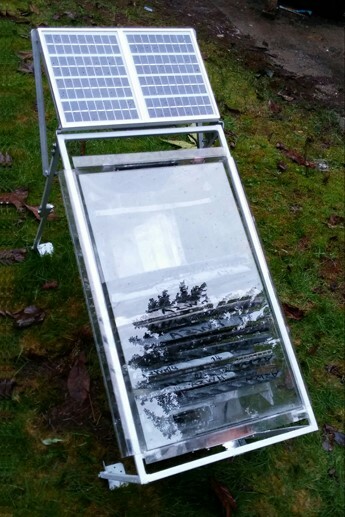 The Air Solar Water technology is uniquely designed to operated in remote off grid locations where ground water is not available. It's salt based desiccant design and use of solar heat as the primary energy allows it to operate in dry locations even deserts. The Air Solar Water model a2wh-83s is a perfect fit to add water for dry cabins in remote locations or research sites where no ground water is available. Wind Power - Turbulence tolerant extremely tough turbines. In much of the world people are without electricity to operate refrigerators. This makes it difficult to keep perishables such as milk, eggs, meat, etc. The same problem occurs even in the USA after major hurricanes until power can be restored. Wind power is a rapidly growing segment but a majority of effort in wind power is aimed large scale wind systems where very large and expensive wind turbines are justified. This still leaves many people around the world without power because they are not on the distribution grids. Our turbines are optimized to produce power in highly turbulent wind common close to the ground. They are ideal for any location where 60 foot poles are not feasible or where wind turbulence destroys other units. Our units have survived 117MPH blizzards in sub zero temperatures with no yokes and no throttles and no damage. Our turbines can range from 10 through 5,000 watts and they are ideal for micro generation such as fence controllers, pumps and remote cabins where they typically augment Photo Voltaic solar panels. We designed a PMG alternator which operates without brushes and build solid state rectifiers. This is critical because brushes are one of the persistently obnoxious maintenance points in many other designs. Our blades are rigid and do not flex in the way may propeller based designs do this allows our blades a very long life. Small turbine 10 to 150 watts with PMG Alternator with PMG alternator. Easy mount with a few screws. Light weight safe for rooftop mounting. Ideal for charging batteries, running laptops, small scale pumping. Compare to a 20 to 150 watt solar panel. 3 bladed turbine - Faster and More Efficient. We are very excited about this design. It turns incredibly fast and starts in very low wind speeds. It is ideally suited for extrusion and when built from clear materials such as ploy carbonate looks like visual art. Includes Video. Includes a outline to allow people to build their own samples. Air conditioning for comfort is the fastest growing consumer of electricity in the world. It is also one of the key drivers for rolling blackouts when demand for power to operate HVAC systems exceeds the grid's capacity to deliver power. Our Renewable cooling system can reduce air conditioning power demands by over 90% during peak demand which occurs on the hottest summer days while reducing power air conditioning power consumption over all by over 85%. This system uses the cold of the night sky to shed heat at night and uses stored cold the next day to keep the building cool and comfortable. It has very few moving parts and can cost less than 1/10th what other renewable approaches would cost. By dramatically reducing the amount of energy consumed for air conditioning our renewable cooling solution can reduce carbon emissions by billions of pounds per year just in California. Government studies have demonstrated that a 1C (1.8F) reduction in surface temperature can reduce evaporation by approximately 2,900 gallons per acre per day. We use a small portion of the cold energy from deeper in the lake to chill the surface water which reduces evaporation while increasing circulation.If the water doesn't evaporate it can be used without reducing the net amount of water flowing downstream or the net lake level. This delivers a win, win for everybody because the process also improves the quality of water being released with higher oxygen levels in the deep water. Our approach uses solar power and is as simple as dropping a bunch of self positioning buoys in the lake. No chemicals, No pipe network, No electric bills and precious little maintenance. Preliminary analysis indicates a cost between $100 and $600 per acre foot saved which is far cheaper than trying to replace the water with desalination. Additional details available. Contact 206-601-2985 to request access. Free: A Ruby script CNCShapeParabola.rb which can generate G-Code to CNC cut the parabolic shape. It can easily be modified for different CNC assumptions. It was designed to cut a parabolic shape from 2" thick Styrofoam which can then be glued together end to end to form a trough of arbitrary length. The intent is to use it as a positive mold. If wood or other heat resistant material is used then it would be nearly ideal for drape forming thermo plastics into a trough shape. The result is a line focus at the Y focus point. In effect this design could concentrate the sun from a 12" wide (trough width) area of sun into a line less than 1/2" wide. This works out to 24 sun concentration and can produce dangerous temperatures. I found that with the most primitive system and aiming a 12" trough 4" long was able to rapidly produce over 240F focus lines in less than 5 minutes. It is part of freeware library CNCUtil Feel free to use the calculations and generate your own G-Code. Here is some generated G-Code from 1 run of this utility FREE-AS-IS-WHERE-IS-NO-WARRANTY Please contact me if you would like enhancements to CNCUtil I am making enhancements on a charge per hour basis. I work on these when I have time and another need such as a larger circuit which needs a repeatable sub-system. If you have ideas for new circuits let me know and I will add them to the list. I also offer design and prototype services 206-601-2985. If you need the source links for any that are not present let me know. Some times I build the circuits and wait to fully document them until somebody needs them. FREE: Circuit with software that shows how to read inexpensive capacitive humidity sensors direct from the micro-controller with just a Diode and resistor without an ADC. Also includes instructions on how to calibrate using saturated salts. Unlike most sensors the calibration is supported at 5 points which delivers better accuracy across the full operating range. This can save a lot of money since the capacitive sensors cost about $4.00 versus $30 for the digital output sensors. The other main benefit is that it makes it easy to combine the sensors with an inexpensive CPU for remote operation. This makes it easy to use 1-wire, RS422 or Zigbee for data transmission which can allow the sensors to be thousands of feet from the main system. As always calibration is time consuming but then the sensors I purchased pre-calibrated quite often read 3% different when installed in the same humidity controlled environment. They also drift up to +- 10% within a year so you must support calibration anyway. Includes schematic and software source code. The non-free version includes automatic calibration software with 5 calibration points and support for multiple sensors. It also includes temperature compensation. FREE: CPU driven solar charger using solid state circuits to allow PWM charging from solar and wind power supplies. Capable of hi-side Switching 17 amps for just over $1.00 in parts and under $3.00 to switch 80 amps. This approach is dramatically less expensive than any of the other digital switches I have found and is easy to construct. It uses a P-channel mosfet, opto coupler and a couple of resistors. Make sure you use a good heat sink if switching at near maximum capacity for the part. Includes schematics and parts list. This circuit can use multiple mosfet transistors in parallel to reach deliver higher amperage capability. CPU driven low side solid state switch capable of switching 17 amps for under $1.00 and and 80 amps for under $3.00. Uses N-Channel Mosfets and a resistor coupled to the CPU I/O line. 1C accurate temperature sensor circuit using thermistor with Bascom software source. Easier to install and wire than many of the modern chip sensors because only needs two conductors. It also draws no power when in the off state and very little when in the on state. It uses 1 ADC channel per temperature sensor. It is nice because readily available thermistors can easily support exposure to high temperatures over 300C. It is most helpful when used with the humidity sensors above. Includes Bascom software example of how to interpolate temperature between manufacturer's calibration points. Also shows software adjusted calibration for the sub 1C calibration. Precision temperature calibration sub system - Software and circuit which shows how to drive TEC thermal couple. The TEC allows the CPU to provide both heating and cooling to maintain the temperature at a specific level. Includes software which modifies the duty cycle as the chamber approaches temperature to avoid overshoot. It also senses ambient to determine weather it should be in predominantly heating or cooling modes. It Includes EPROM saving of calibration offsets to allow find 0.1C calibration. It uses the shortest pulses possible with the TEC which increases the TEC efficiency. Also includes a maximum duty cycle stored in EPROM to allow larger TEC modules to be used. This circuit uses a commercially available h-bridge to switch up to 3 amps for heating or cooling but could be adapted to use the higher amperage H-Bridge circuit described below. Sense the approach or withdrawal of human body using electric fields. Well actually it senses the increase or decrease in strength of negative and positive static fields. In many conditions has several foot range. Can be particularly helpful when detecting the approach or withdrawal of strongly charged plastics. Requires an antenna but I used simple aluminum tape and it worked well. H-Bridge forward / Reverse motor driver 80 amps and easy to double or triple amperage as needed. Uses 2 P-Channel Mosfet and 2 N-Channel Mosfet. Can also be used to drive large scale TEC thermal couplers for heating and cooling. If you have been shopping then you know that high amperage H-Bridge chips are very expensive. This circuit costs less than $5 for 20 amps and less than $10 for 80 amps. It includes a integrated CPU and software for forward reverse driving. Uses PWM to support motor speed control. Also includes inbound command interface to allow the entire system to be mounted close to or on the motor. High voltage pulse driver to attract H2O molecules to a condenser surface. If you hold a static charged comb next to a falling stream of water the water will bend towards the comb. This is due to a the water rotating the two hydrogen atoms to face the negative field and then having a slightly stronger attraction than the oxygen atom at the other end. This can be used to attract H2O molecules to surface a conductive surface. H2O generally will not condense until it is either very close to or in contact with the condensing surface. Switching high voltages is always tricky but this circuit makes it easy. Warning this circuit uses voltages that can be lethal. Bascom source to read data from a GPS chip's serial data port. Includes read averaging to detect when the reads are sufficiently stable to record for high precision relocation at a future time. Can save GPS readings in EPROM. Long term standby circuit which yields zero power consumption when in the off state and automatic sleep to 0 power consumption. Allows devices to be stored for long periods of time without discharging the battery. Boy I wish my PDA had this capability. Simple capacitive sensor with software. Allows a standard CPU I/O line to detect presence contact with human body. The sensor can be as simple as a piece of conductive plastic. Calculating resistance of a variable resistance type sensor includes Circuit and software. Software and circuit to drive LCD display from AVR micro controllers. Can use either 4 or 8 bit interfaces. Serial LCD are expensive but the parallel units are cheap often under $3.00. It can be worthwhile combining a cheap 4K CPU with the LCD to provide a 1 wire, RS232 or I2C compliant interface. Tested with a wide range of 1 and 2 line LCD modules. Circuit and software source using a Triac to drive large resistance heaters. Measures the AC sine wave which allows the system to switch on the heater for only a portion of each AC sine wave cycle which yields a very smooth ramp. Easily switches 20 amps at 110V and with minor part changes could switch 100 amps provided the wires and traces are all upgraded. This circuit uses 1 opto coupler to sense the AC cycle and a second opto coupler to drive the Triac. We use a more advanced version of the software to drive high accuracy heating chambers and our plastic bender which requires precise application of heat for precise amounts of time. The same circuit can also be used to run AC motors in a fashion similar to router speed control units. Because it is an all off or all on circuit with very low resistance in the on state it has very low heat dissipation compared to the current transfered. It can use multiple triacs in parallel to increase amperage capability. An interesting feature of this circuit is that it can drive motors and heating elements that would draw enough power to trip the breaker but simply by using them at a low duty cycle we can control the total power consumed and limit it to safe levels. This allows oversizing of the heating elements which increases their life. MPPT type benefits for charging from wind turbine without the MPPT costs. One challenge with wind systems is that the turbines provide radically changed voltage output depending on wind speeds. This can negatively affect efficiency. You can adjust wind turbine windings return the optimal voltage at the designed operating speed but then you do not have enough voltage for low speed operations. This circuit uses multi tap transformers and a series of TRIACS to connect and disconnected different windings based on the current wind speed in an attempt to deliver the most optimal output. The design allows the wind alternators to be designed to reach optimal charging voltages at 20MPH but deliver charging currents at much lower winds speeds. In this design we range from a 8 to 1 voltage amplification so the alternator generating 1.6V in is amplified to 12.8 which is enough to charge even in very low wind speeds. When the wind is at the design speed we bypass the transformers pay no extra overhead. This circuit also has the ability to sense battery voltage can use PWM techniques to limit charge rates. It even adjusts the voltages to the battery so it delivers the lowest voltage capable of charging the battery which delivers the highest charging amperage. It also detects a fully charged battery and can shut the power to an alternative load. All the while it accumulates the power output provides this information in a serial output for data logging.